I’ll be trying this one out as soon as the exams are over! Thanks for it, if it wasn’t there I would have thought of making it myself because I think that it are these kind of plasmoids that are really useful. I was so glad when i have read this blog! I missed an RTM app or plasmoid in KDE. Thanks, i will test it as soon as i can! It’s very pretty. Does it have any layout problems when the task list is updated? I have had a lot of hassle from QGraphicsLinearLayout (and Grid) with NetworkManager-kde4. I don’t have any layout problems that I know of, and I’m adding, removing, changing tasks with the applet. I use a Plasma::TreeView with a standard model/items and a custom delegate to do the fancy drawing. My layouting doesn’t change every and only contains the top label, tabbar, treeview, and bottom line edit. I am a little dissapointed that the Plasma::TreeView doesn’t let me do cool things like smoothly resize a single entry, but such is life. It wasn’t designed for that. I created an RTM account just for this. Do you know a way to implement this? Am reluctant to install though, coz I cant find a simple instruction. could you make a .deb package for DL? or explain, what is meant by playground? Cheers and keep up the work PLEASE! Sorry, supporting nested tasks when RTM doesn’t would really muddle what is stored in RTM and wouldn’t allow for clean editing from other services or from RTM itself. I don’t plan to implement it. playground is an area in KDE’s source (http://websvn.kde.org/trunk/playground) that is generally highly experimental and not ready for production use. At the moment there aren’t any packages for the rememberthemilk plasmoid, and for now that’s a good thing. It’s still changing fast and in my opinion isn’t ready to be packaged. I posted a comment in an earlier blog post. Unfortunately it stopps with “no data yet. refreshing”. My login works and I have some tasks. Any idea where to look? To those having issues with “No data yet. Refreshing”, it’s due to some uncommitted changes I made. If you svn up now everything should be better. - Also adding tabs that hold a search for tags would be very cool! Overall these are just some comments, but you already did a great job on this plasmoid! I’m glad you’re liking it =). 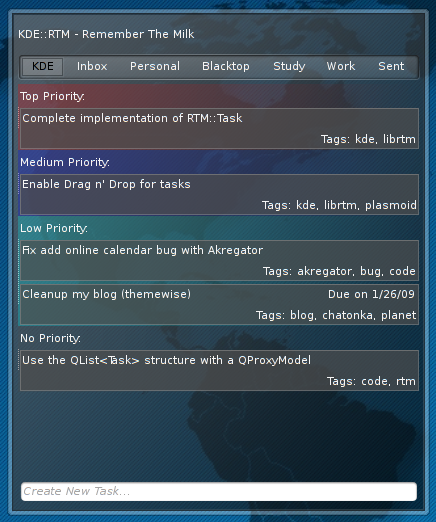 - Yes, it’s a (known) bug that all tasks doesn’t show all tasks. I’m not sure I want it as a tab. - I want to think about the interface for things like search, overview (which could be a customized search really), all tasks. I’m not sure more tabs are the right way to go. - Tasks of the same priority are supposed to be sorted by due date, but there’s some bug in how I’m sorting them. Not sure yet, but it is known. First of all great plasmoid! I’ve been experiencing a couple of issues though..
1. Huge fonts in task lists. I’m not sure this is related to your code however, since your screenshots look different. The fonts are bigger than the tabs and priority ones. 2. Smart lists are not showed. I can see their tabs, but the task lists are empty. Yes, I know smart lists are not shown. The librtm library doesn’t support that yet, it’s more of a project and I’ll do it when I have some free time. I don’t have any other place for the bug reports atm…. but it would be nice. I wonder if there’s an easy and simple service…. The code is in kde’s svn but it’s not a released plasmoid and I’m pretty sure they generally don’t have separate “app” definitions for each plasmoid. If you have suggestions, I would love to hear them.